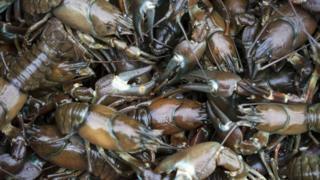 A study of the impact of an invasion of non-native crayfish on a south of Scotland loch has found fish stocks in its waters remain "healthy". Repeated concerns have been raised about the situation in Loch Ken in recent years. However, the study found stocks remained strong despite the presence of North American signal crayfish. The report's author said it was "encouraging" to see how healthy the fish population in the waters remained. As well as stock levels, the study - commissioned by the Galloway Glens Partnership - looked at the importance of angling on the loch and the impact of the crayfish. Among the recommendations were better promotion of the area, further monitoring of fish numbers and continued management of the fishery. Nick Chisholm, Galloway Glens project officer, said: "The presence of crayfish is not ideal, but this report illustrates a healthy and self-sustaining fishery. On the mainland of the British Isles there are very few wild stillwater fisheries of this magnitude; an angler could spend weeks exploring by bank and boat and find something new on every visit." Scottish Natural Heritage's Callum Sinclair said: "The findings indicate a healthy fishery and a flexible and resilient set of anglers who have, in the main, adapted their techniques to minimise the crayfish impact on the enjoyment of their pastime." Jamie Ribbens, of the Galloway Fisheries Trust who undertook the report, said: "This was an interesting piece of work to be involved in delivering and it was encouraging to see how healthy the coarse fish population of Loch Ken is. There are many opportunities to develop this fishery further for the benefit of the local community and anglers from around the UK." The Scottish Environment Protection Agency's Anne Connick said: "It is very encouraging to see the results of this important study which indicates there is a healthy coarse fish population in Loch Ken. This is good news for the environment, and also for local and visiting anglers, and we will continue to work with our partners to help ensure the sustainable future of Loch Ken." Karen Morley, countryside development officer at Dumfries and Galloway Council, added: "Coarse angling is one of the many activities supported by the loch, it is interesting to see the impressive size of some of the fish being caught around the loch in recent years and we will be doing everything we can to make sure this amazing natural resource is used to drive economic activity and encourage more people to visit."